BAAKARI WILDER has had an outstanding career. Savion Glover's understudy in the Broadway production of "Bring in 'da Noise, Bring in 'da Funk," Baakari is a native Washingtonian whose dancing has delighted audiences at the Kennedy Center, Smithsonian, National Theater, Corcoran Gallery of Arts, Levin School of Music, Dance Place, and a variety of other theaters throughout the metropolitan area. He studied tap under Savion Glover, Gregory Hines, Honi Coles, Cholly Atkins, Harold Nicholas, Lavaughn Robinson, and Maurice Hines. He has appeared in Honi Coles' Memorial Tribute, Jazz Tap, and Savion Glover & Friends. He has also shown his versatility as an actor with performances at Folger's Shakespeare Theater and at Bowie State University. Baakari has made several television appearances as well: as a dancer (Jazz Central on BET, Savion Glover on BRAVO), as an actor (Homicide on NBC), and as a TV guest (The Today Show, with Rosie O'Donnell, The Tonight Show with Jay Leno, the 1996 and 1997 Tony Awards). Baakari has been a member of the Queen's Chapel United Methodist Church music ministry since an early age, and is President of the male chorus. 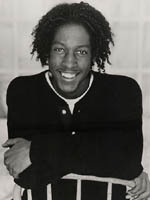 Baakari was an original member of the Bring in the 'Da Noise, Bring in 'Da Funk cast (1999). He received cash awards in theater and dance from the National Foundation for Advancement in the Arts (1994). He has studied personally under masters such as Gregory Hines, Savion Glover, Jimmy Slyde, Brenda Buffalino, Renee Kreithen, and Yvonne Edwards. He was a member of the American Tap Dance Orchestra at an early age and also founding a member of Tappers With Attitude of D.C. (1991). In New York City, Baakari teaches at the Broadway Dance Center. Guest teacher at the ImPulsTanz, Vienna, Italy's international dance festival.